Manny is a tabby cat that has mastered the Instagram selfie. Putting humans to shame, Manny is an expert at posing for his GoPro, and managing to get all his furry friends in the shot too. 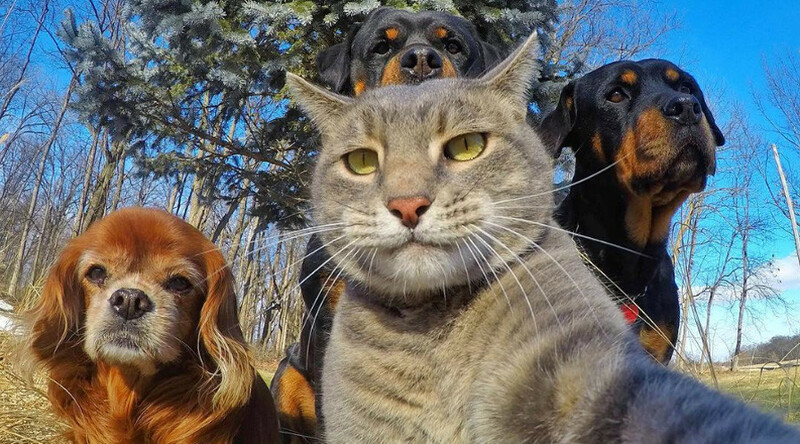 The feline photographer has already clocked up more than 248,000 followers on Instagram, and it seems Manny’s best work happens when it comes to the group selfie. He effortlessly manages to get his whole crew in his excellent pictures. His latest group selfie could be his best work to date and, rather impressively, the snap has racked up more than 20,000 likes since being posted on Tuesday. Manny was rescued by Yorem Ahm in Arizona in 2014, and soon found his calling with his owner’s GoPro. He quickly became a viral sensation last year and continues to impress with his top notch selfie game. Having a look at some of Manny’s best group shots will be sure to raise a smile, while also leading to questions about just how a cat is better at selfies than most of us. Manny is not the only cat rocking the Instagram selfie. ‘Weird Beard the Cat’ is also a fan of such poses, and just so happens to be Manny’s brother, according to Instagram.